At the IWRC helping businesses, communities and organizations reduce waste is what we do. As the problems surrounding food waste become more and more prominent, IWRC is working to reduce this waste and divert it from the landfills but how many Americans know the facts about food waste? Better yet, how many Americans believe the myths associated with food waste? Our team of environmental specialists and waste experts are here to bust four of the most common myths we hear. To prevent waste from ending up in landfills, create your own composting station! Check out our Residential Composting Toolkit to get started! Are ugly people bad people? Of course not! Our need to be beautiful has carried over to our produce! When given a choice, people choose the better-looking product even if the nutritional value is the same. Businesses, stores and people throw tons of food away simply because it doesn't gleam with perfection. Think about it this way, before genetically modified food, a majority of produce was scuffed up and far from perfect. For example, a grocery store in Provins, France sells ugly produce at a reduced price. Their store increased shopper traffic and profits! We need to change our perfect produce mindset, it might make cents. Don’t discriminate against less than perfect food, it’s shallow. Unfortunately, food waste in landfills is a massive problem that is only getting worse. According to Food Waste News, ⅓ of all food produced globally is wasted or thrown away. Where does all this food waste go? Mainly landfills. 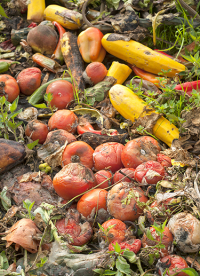 To bring it close to home, American’s contribute 96 billion pounds of food waste annually. Food waste is overcrowding American landfills, with each American on average producing over 200 pounds of food waste each year. Let’s get specific to Iowa. The IWRC article, The Importance of Food Waste Reduction, referenced the 2011 Iowa Statewide Waste Characterization Study performed by the DNR and found 13.3% of all landfilled waste in Iowa is food waste. Also, that food waste is the number one category for municipal solid waste in Iowa. Food waste is a serious problem. For businesses and organizations, it is not much different. Inventory, monitor and change ordering habits accordingly. In addition, take advantage of donating edible food to local non-profit hunger relief agencies. It keeps food out of the landfill and ensures it gets used for its intended use - to feed.